I am definitely one of the most readily and easily recognized of all breeds. We originated in Dalmatia, in what was formerly the country of Yugoslavia. Back in the 1800�s, my relatives worked as carriage dogs, but as fewer and fewer jobs of that sort became available, the Dalmation found jobs in fire houses helping firemen locate and rescue victims. Soon we began to be called the Fire House Dog. My coat is smooth, sleek and close, requiring no special grooming, but I am very energetic and require quite a bit of exercise. Please don't expect me to live in an apartment unless you have the time to take me out for exercise every day. When fully grown, I am between 19 and 23 inches tall (48.3 to 58.4 centimeters) and I weigh between 50 and 55 pounds (22.5 to 24.8 kilograms). 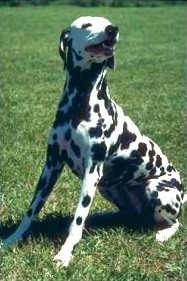 We have no Dalmation Breeders listed at this time. Click here to place your Dalmation Ad!